Farm waste and manure stockpiles are organic matter used as organic fertilizer in agriculture. Waste and manures contribute to the fertility of the soil by adding organic matter and nutrients, such as nitrogen, that are trapped by bacteria in the soil. Manure is good for cultivated crops. Not so good for human consumption. 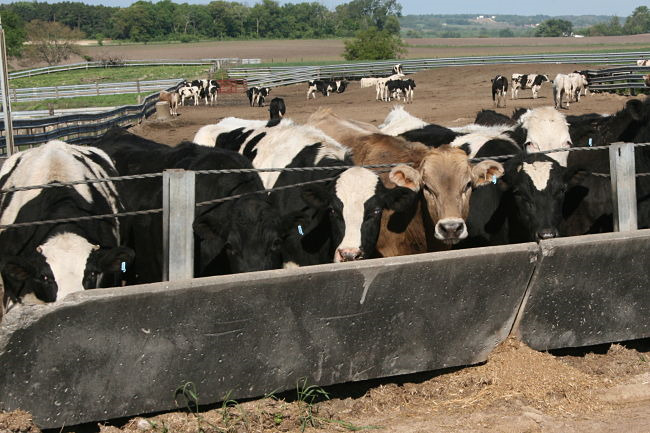 Manure stockpiles and animal feedlot runoff may contaminate drinking water wells. Have your well tested regularly. Common forms of waste and manure include decomposing plant matter, leftover or rotten feed, plants grown in a field specifically for the purpose of being plowed into the ground and farmyard manure (FYM) or farm slurry (liquid manure). All of these manures and wastes are contain large quantities of nitrogen and phosphorus. Chicken manure is the highest concentration of nitrogen and phosphorus out of all the waste and manures. Nitrogen and phosphorus are key nutrients for plants to grow and flourish. However, nitrogen and phosphorus can runoff or leach into the groundwater when the concentrations are too high for the plants to absorb. These nutrients can then get into water supplies and directly or indirectly cause harm. Directly they can poison people and indirectly they can cause the cause the death of fish and other aquatic animals. Feces that are directly placed in the water can also poison people. Provide your environmental professional adequate time to perform their work thoroughly. This advice is particularly important during the Phase I Environmental Site Assessment process. Given adequate time, your environmental professional may be able to locate information that precludes the need for costly testing. There never seems to be enough time to do something right the first time, and always enough time to do it right the second time.